We want to exceed your expectations! That’s why we are dedicated to delivering a hot, delicious, high quality meal right to your door. We are proud to source high quality proteins and ingredients from reputable vendors. All of our steaks are 100% grain-fed USDA graded American beef. So whichever cut you order, whether it’s a ribeye, sirloin or T-bone steak , you’ll definitely be able to taste the difference. All of our jaw-dropping steaks are seasoned with our secret sauce and grilled over an open flame, creating a flavor you won’t be able to resist. Although we are named for one of our most popular menu choices, we do a lot more than just grilling steaks. We also apply our fire-grilling expertise to chicken, shrimp, and a variety of sandwich options, including another very popular order, our signature cheeseburger. All of which are only placed on the grill at the time of your order, to ensure they are delivered hot and fresh every time. 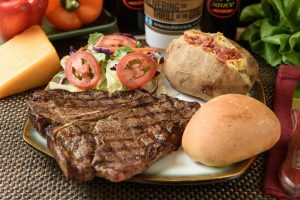 We may take a little longer to prepare your meal than the fast food place down the street, but it is worth the wait to savor the fresh-off-the-grill flavor. 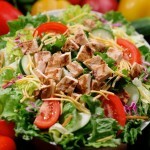 Our menu includes a number of delicious salads prepared fresh every day. We have smaller side salads to start your meal off right, or larger grilled salads to fill you up. Just tell us if you want steak, chicken, or shrimp and we’ll add the grilled flavor to make your salad just right. Have You Heard of Our Dangerously Delicious Desserts? 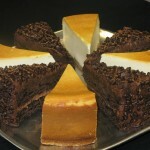 Steak-Out’s creamy, dreamy NY Style Cheesecake is a top contender when deciding what sweet note to end your meal with. But the Death by Chocolate Cake doesn’t hold back any punches, as its dark chocolate decadence melts in your mouth. Having trouble deciding? Order one of each, sample them both, and save the rest for later. We know it won’t go to waste, as you won’t be able to resist going back for more. At every Steak-Out you will find our signature menu items, so you know just what to expect. Many of these items can be served as an entrée, a lunch special or on a sandwich bun. 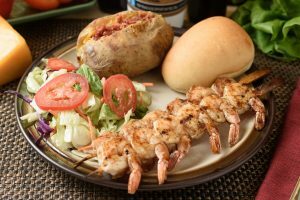 These items include but are not limited to: ribeye steak, sirloin steak, chopped steak, grilled chicken, and grilled shrimp. However, since Steak-Out was founded back in 1986, in Huntsville, AL, Steak-Out has always strived to be a part of the local community. We have franchise locations throughout the Southeast and as far west as South Dakota. And we tailor each one of the restaurant menus to match the local flavor. For example, we sell St. Louis Smoked Ribs in Swansea, IL, a Macon Bacon Burger in Macon, GA, and various soups in the Fall and Winter in Sioux Falls, SD. Want to taste all of the delicious food delivery options available at your local Steak-Out restaurant? Then find your nearest location and give them a call or order online. We’re experts in delivering the thrill of the grill.